After league leaders CFR, the second placed team, Dinamo, changes the coach! Bonetti returns to Dinamo, but Dinamo has little chances to regain the top spot. If CFR Cluj got rid of Jorge Costa after a 0-5 defeat at home against another title contender, Dinamo Bucharest took the same call after a 1-3 defeat at home against Petrolul, a team that struggles to avoid relegation. 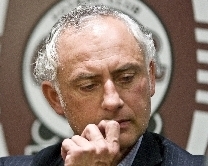 In both cases, the boards went for coaches who have been previously in charge of the two teams, but if Ioan Andone has won a title with CFR, nothing notable springs to mind when you think of Dario Bonetti’s first spell with the Red Dogs. Instead of giving a wake-up call to the players – veterans Catalin Munteanu, Ionel Danciulescu and Marius Niculae, who were in top shape until December, were offered new deals in January and their performance instantly dropped afterwards -, the board sacked a humble, but dedicated young coach, who had created a functional and, at times, attractive 4-4-2. This move will anger the anyway disgusted fans, the very influential agents Victor and Ioan Becali, as well as a club legend like Cornel Dinu, and with so much unrest withing the club’s ranks I doubt that Bonetti’s arrival could have a positive effect on a team that was cruising in Liga I in the first half of the season and now will have to chase CFR, but also keep an eye on their biggest rivals, Steaua and Rapid, who took advantage of the recent unconvincing displays and results. Mandorlini skipped training, so CFR could start playing better! After yet another disappointing display and an unexpected defeat in Galati, CFR’s coach Andrea Mandorlini left his assistants take over today’s training session. Obviously, the press speculated about a possible replacement, with president Iuliu Muresan in a short trip to France (where the out of contract Laszlo Boloni resides), but this could be just one of the Italian’s methods to turn things around, after he has failed to put together a solid team and a style of play in the three months long winter break :-). Following Adrian Falub’s resignation, Unirea Alba Iulia is close to signing former Steaua coach, the experienced Dumitru “Titi” Dumitriu. Indeed, this might be a good choice for an otherwise decent team to at least have a shot at avoiding the drop. 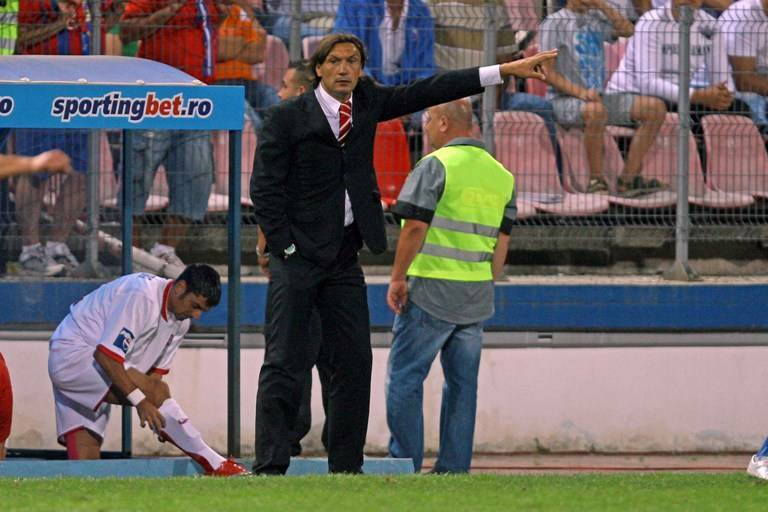 National team coach Razvan Lucescu has challenged Florin Costea to help his team avoid relegation, in order to get more attention from him in the near future. Costea is a regular scorer in Liga I, plus Universitatea’s best, highest rated, star (etc, etc) player and most pundits cannot understand why he’s not getting regular call-ups from Lucescu jr. I’m not one of them ;-). Steaua’s owner Gigi Becali threatened coach Mihai Stoichita, after his desire (to drop Alexandru Tudose from the first team) was ignored in the 2-2 draw against Unirea Urziceni. Stoichita collected 2 points out of 9 this year and is yet to play the likes of Parpas and Tall, defenders bought by the club at his wish. This is definitely the last warning from Becali, but I won’t be surprised to see Stoichita sticking to his choice, knowing the huge pressure he’s been under since his arrival and that he has reached a point where he contemplates leaving the club anyway. Did Mandorlini fall asleep during CFR-Steaua? After a very poor transfer campaign, which resulted in a Ghionea&Rada – Parpas&Jelev switch, Steaua’s coach Mihai Stoichita has every reason to think about Ovidiu Petre‘s move in central defense. Petre is a natural anchorman, who matured a lot in the last couple of years, but unfortunately for him couldn’t perform consistently, being quite prone to injuries. Petre would bring composure and aerial strength in defense and would also be the type of centre-back that Stoichita wants, one that has enought technique and vision to start the team’s build-up from the back four. Poli Iasi announced a debt of over half of million euro towards the state budget (unpaid taxes and health ensurance) and is among the first division clubs that will struggle to obtain the license to play first division football next year. Poli also has some debt towards other firms, while the players received this month the wages they were supposed to get in December. Dinamo looks quite desperate in the club’s attempts to sign some players, mainly defenders, a week before the start of the second half of season. With the first team in the final days of the training camp from Turkey, the reserve team has been testing players like the Czech Martin Zivny (28), from Austria Karnten, and the Brazilian Joao Paolo Fernando (20), brother of Roma’s Brazilian goalkeeper Doni. The Bucharest side is also hoping to get its hands on Nikola Vukcevic (25), from Buducnost Podgorica, who apparently is expecting his visa to come and negotiate personal terms. After the signing of Razvan Cocis, Portsmouth seems interested to capture Robinson Zapata Rufay (31), in order to secure a backup solution for veteran goalie David James. The Colombian keeper has been a key player for Steaua since his arrival in 2007 from Cucuta (78 matches in the league, in two and a half seasons) and managed to turn in his favor a difficult scenario at the beginning of the current season. Steaua had bought the promising Ciprian Tatarusanu for a huge transfer fee and tried to impose him in goal, but Zapata stayed calm, trained well and once he got a chance to return, showed an impressive form and regained his status and regular place in the first eleven. Dinamo’s attacking midfielder Adrian Cristea (26) has been linked with Espanyol Barcelona. Apparently, the Primera club wanted the talented, but rarely motivated player on a loan deal, until the summer, with the option to make the deal permanent afterwards, but Dinamo rejected, as the Bucharest side would prefer an unconditionned sale right now. Pawel Golanski (27) is expected to extend his deal with Steaua today, a move that would block Rui Duarte’s (29) transfer from FC Brasov. The American midfielder Josh Tudela (25) also asked the club to decide on his future, although coach Mihai Stoichita would prefer to extend the trial period and further test the player during the team’s second training camp.